With settlements dating back to the Nuragic age, Guspini is a territory rich in history and natural beauty. Guspini is located in Southwestern Sardinia, in the Medio Campidano region. With settlements dating back to the Nuragic age, Guspini was officially founded in Medieval times when it was part of the Giudicato di Arborea. Guspini’s historical town center, which developed around the main square, offers a number of religious buildings of great artistic importance, such as the Church of Santa Maria di Malta. Nearby you can marvel at the archeological sites that trace the most import phases of Sardinia’s history, from Nuragic remains to the Phoenician-Punic civilization of the city of Neapolis. Not only archeology, Guspini boasts also a great natural heritage that is both unique and unchanged by time. It stretches from the mountain range of Monte Linas to the fascinating dunes of Costa Verde or Marina di Arbus. However, its history is mainly linked to the mines of Montevecchio, one of the eight mining sites that make the Geomineral Historical and Environmental Park of Sardinia, a UNESCO world heritage site. With an area of 174 squared kilometers, the territory of Guspini boasts a rich environment, both in terms of flora and fauna. For those who love active tourism and hiking in the open air, we recommend ahike to Monte Linas, one of Sardinia’s most ancient areas. There are plenty of woods, springs, local species such as the Sardinian deer. Or hike to Monte Arcuentu, a volcanic mountain range made mostly of basalt formed when ancient lava flows solidified. It is not an easy hike, but very rewarding: the view from up there is quite unique! For those who love birdwatching, the pond Santa Maria di Neapolis is where pink flamingos found their ideal habitat. Instead, in the town of Guspini you can walk up to the top of the Cuccuru Zeppara hill to admire the basalt columns, a rare natural occurrence that looks like massive organ pipes formed during the cooling of a lava flow. Of course there are plenty of religious festivities. The most important one is Santa Maria di Malta, celebrated from the 13th to the 22nd of August. A visit to Guspini means delving into Sardinia’s mining society, and the old hamlet of Montevecchio is the best example of industrial archeology. About 8 km from Guspini, in Montevecchio you can take part in several tours to discover what life in the mines was life, visiting the storage facilities, refineries, miners’ quarters and the mines themselves, the Piccalina and Sant’Antonio mines. There are many churches in Guspini’s historical center, such as the Church of San Nicola di Mira, built in 1600 in Gothic-Aragonese style, and the church of Santa Maria di Malta, built in the 11th century in Romanesque style. It became an integral part of a convent of Greek-Byzantine monks, and later became property of the Knights of Malta. As evidence of the ancient origins of these land, in Guspini there are several Nuragic ruins, such as the Nuraghes of "Melas", "Saurecci", "Brunku and s’Orku", the sacred well “sa mitza de Nieddinu”. From Guspini you can reach Costa Verde or Marina di Arbus which stretches for about 47 kilometers, one of Sardinia’s most pristine and unique coastlines. 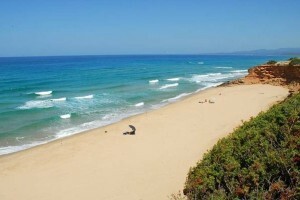 27 km from Guspini, Piscinas beach is one of the jewels of the Mediterranean. A fully fledged desert, 7km long, with dunes that reach 60 meters, slowly disappearing into the sea. There is a kiosk with food and beach umbrellas and chairs to rent. From Guspini continue towards Montevecchio and follow the signs for Piscinas beach. Within Costa Verde as well, Scivu is one of the most pristine beaches as there is no settlement of any kind nearby. It is characterized by wide sandy stretches against massive rock walls, in front of the crystal clear sea. You can reach it following road SS 126 from Guspini. Near the town of the same name, this beach is 2 km long, with a reddish sand because of the iron present. Ideal for children thanks to its shallow waters. It has a few facilities, such as a kiosk and parking. It derives its name from the Flumentorgiu tower, used by the Spanish in the 17th century as a watchtower against the raids by Saracen pirates. Surrounded by the Mediterranean maquis, its main feature is the white color of its sand. You can reach it following road SS 126 from Guspini and then road Sp 65.